Whilst concentration and imagination are the most important ingredients at homework time, there are plenty of materials that can also prove useful. From organisation and presentation materials, to revision and research aids, make sure you are fully equipped to tackle your homework tasks. Sound organisation and time management skills are vital if you are hoping for homework success. Luckily, there are plenty of materials and resources that can help you stay on top of your workload. Be sure to buy a homework diary, if your school does not provide you with one. Use this to keep track of your homework tasks and their deadlines, as well as a place to document your achievements and objectives. A reading log will also prove useful; a simple ruled notebook will do. Use it to write down the title and author of every book you read, the date on which you completed it and a few notes about your views on it. Folders will also come in handy when it comes to organisation. Ensure that you have a different coloured folder for each subject you study and use coloured card dividers to keep your work, notes and information sheets in order. You can also fix separate sheets of paper together using a stapler, paperclips or treasury tags, depending on your homework task. Presentation is a very important aspect of the homework process. There are a number of materials that can help you to present your ideas in a clear and coherent manner. Ruled A4 paper is a must for straight handwriting and a ruler is necessary for underlining titles, subheadings and dates and for drawing diagrams and graphs. A rubber is important for avoiding unsightly crossings out and ink eraser may come in handy if you write with washable blue ink. 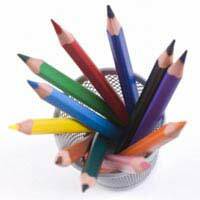 Coloured pencils are ideal for pictures, illustrations and decorations and create a neater finished product than felt tipped pens. Of course, you will also need a good selection of pencils and black and blue pens. Opt for a fountain pen if you are aiming for clear, uniform handwriting. You will need a handful of refill cartridges for this. Highlighters are a true revision favourite, enabling you to develop your own colour coding systems and speeding up the learning process. Invest in a variety of colours and sizes. Revision guides can also prove useful, but be careful to ask your teacher which one they recommend. Be sure to invest in a pack of blank flash cards too. These are ideal when it comes to learning short snippets of information, such as quotes or vocabulary, enabling you to test yourself. Blank audiotapes and a tape recorder, or even a PC or mobile phone voice recorder, are great revision aids. Record yourself reading the information you need to learn, replaying it and repeating it out loud until it is committed to memory. If possible, keep a large clock or alarm clock in your homework area. This should help to cut procrastination, enabling you to set time related goals and keep track of them. A desk or table of an appropriate height is a must as working in bed or on the sofa or floor will hurt your back and neck. A kitchen or dining table will do. Take care to invest in a desktop lamp, as good light levels are vital when it comes to protecting your sight whilst hard at work. A chair with a supportive back is also advisable. When researching, keep a valid school library card and a community library card close to hand so that you can check out the books you need. Access to the internet is also a must. Have a talk with your family and arrange a half hour or hour long slot in which you can do further reading online. Keep a good stock of printer paper at hand, along with spare ink cartridges. If possible, invest in a large dictionary and get into the habit of using it regularly. A thesaurus will also come in handy, particularly for creative work. Whilst the materials mentioned above add up in cost, it is possible to find them cheaply. Local pound shops often stock affordable stationary items, for example. Revision guides can be borrowed from the school library and you can get online at your local library during the evenings or at the weekend. Remember that having useful materials at hand works to take some of the stress out of homework tasks.